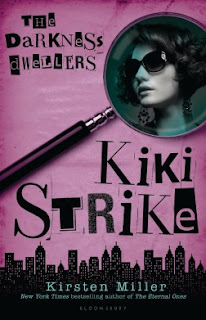 So I had never been exposed to the Kiki Strike books before agreeing to be a part of this blog tour, and I am so glad I was given the opportunity to read the whole series. I flew through them all, and I hope there will continue to be more books in the series down the road. I'm going to do my best to avoid spoilers for the first two books in the series, but I'm going to tell you to go out and read them right now. You really won't regret it. In this third adventure starring Kiki Strike and the Irregulars, the band of girl geniuses venture beneath Paris, attempt to foil the usurpation of an Eastern European nation, and stay out of the clutches of a brainwashing etiquette maven. Plus they have to deal with boys and evil twins, both new experiences for our narrator, Ananka. Things get pretty busy, as you can imagine, and loyalties and strengths are all tested. Everyone is not as they seem—but this is not always a bad thing. Miller has continued to bring surprise and humor to wonderfully creative capers. Kiki and the Irregulars, all of whom have their own specialties (chemistry, engineering, disguises, hacking, etc), continue to surprise me with their ingenuity and capability in the face of equally interesting and complex foes. I never know where we'll end up in these stories; twists keep coming at the reader throughout the telling. I really like how in each new volume we examine one of the Irregulars a little bit closer than we have before. In this one, we learn a bit about Betty Bent, who the rest of the gang worry is too nice for her own good in certain situations. She has suffered from low self-esteem in the past, and she has gotten herself into trouble before, but she is ready to prove herself by being the one sent on a mission to Paris in order to help Kiki. Miller has a great command of simile and language, and I often found myself laughing at one-liners. My only problem was that I was sad the Irregulars started to have romance added into their lives. I understand that it's normal and should be expected, but a part of me still wishes boys were not added into the mix. Oh well! I loved how original it all is, and really the whole series is just a lot of fun. I highly recommend these books, including this newest addition, to anyone who likes adventure, espionage, and intrigue, especially in teen literature. Disclosure: I received this book, along with the two earlier books in the series, from the publisher in exchange for an honest review. I just put the first one on my goodreads to-read list. :) It's only .99 for Kindle! It is a really fun series, I really enjoyed reading them. Glad to hear the first is an e-deal!